We envision a transformed school system that has directly confronted and actively addressed inequity and injustice so that every OUSD student graduates and becomes a fully engaged member of our community. To inspire, engage, and support the students, families, and communities of OUSD in becoming authentic co-owners of our schools, sharing responsibility for every student becoming college and career ready. 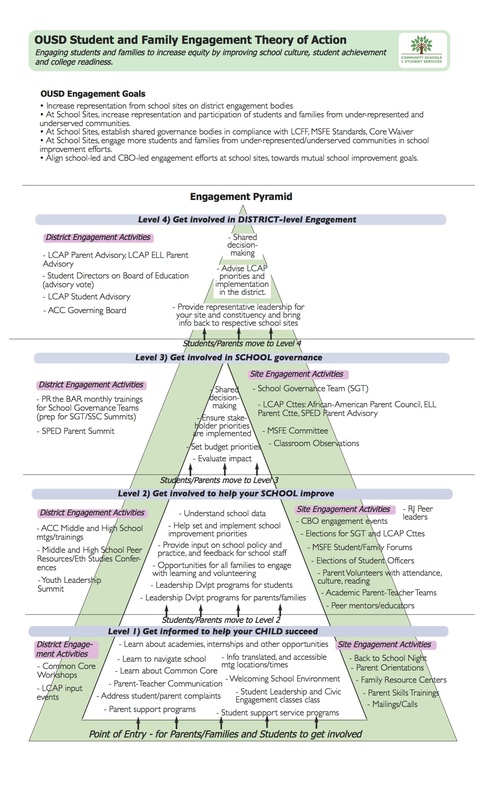 To expand participation in learning, leadership, and advocacy through community organizing and building OUSD capacity, resulting in high levels of academic achievement and life opportunities for students and school communities. Families in our community and their unique, diverse experiences. Love, care, compassion, and respect for students and families. Students and families as leaders and agents of change. Authentic democratic decision-making (students/families/communities as equal partners). Self-determination through community and family empowerment. Bridging OUSD staff with students, families, and communities. Engaging in healthy struggle for positive change. *If you have questions about any content on our website, please contact us for more information.